After only two and a half days of deliberations, the Apple v. Samsung jury handed down a sweeping victory for Apple, finding Samsung infringed on all but one of Apple's asserted patents while the iPhone maker didn't violate any of the Korean company's properties. Update: Following a discrepancy in the jury's verdict, the damages amount has been dropped to $1.049 billion. Jurors deciding the patent suit have reached a verdict just three days after hearing closing arguments from the parties' counsel, finding Samsung to have infringed on certain Apple patents, according to in-court reports from The Verge. The damages owed total nearly $1.05 billion for Samsung and zero for Apple. '381 "rubber-banding" patent: Yes for all devices. '915 "pinch-to-zoom" patent: Yes for all devices except for Intercept and Replenish smartphones. '163 "tap-to-zoom" patent: Yes for Droid Charge, Epic 4G, Exhibit 4G, Fascinate, Ace, Prevail, Galaxy S, Galaxy S 4G, S II AT&T, i9100, S II T-Mobile, Galaxy Tab, Tab 10.1, Infuse 4G, Mesmerize and Replenish. No for Captivate, Continuum, Gem, Indulge, Intercept, Nexus S 4G, Transform, and Vibrant. D'667 iPhone design patent: Yes for SEC's Fascinate, Galaxy S, Galaxy S 4G, Galaxy S II for AT&T, Galaxy S II i9100, Galaxy S II for T-Mobile, Galaxy S II Epic 4G Touch, Skyrocket, Showcase, Infuse 4G, Mesmerize and Vibrant. Yes for STA's Galaxy S 4G, Galaxy S II for T-Mobile, Galaxy S II Epic 4G Touch, Skyrocket, Showcase, Infuse 4G, Mesmerize, and Vibrant. 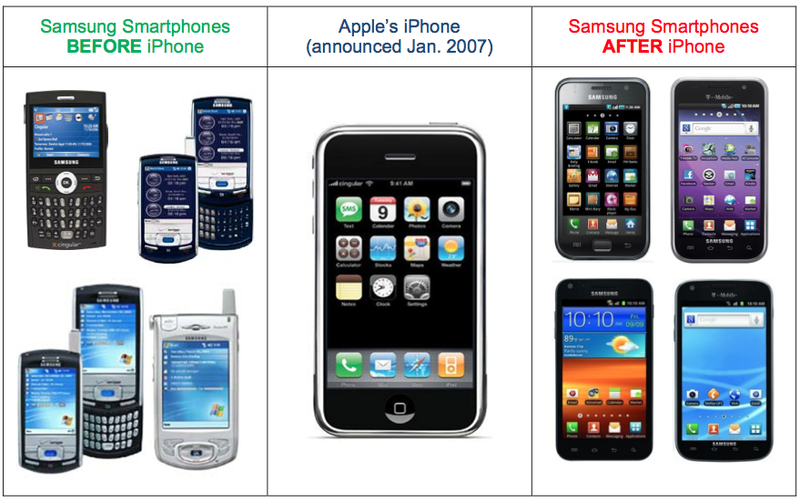 D'087 iPhone design patent: Yes for SEC's S i9000, Galaxy S 4G, and Vibrant. No for Galaxy S II ATT, S II i9100, Epic 4G Touch, Skyrocket and Infuse 4G. Yes for STA's S 4G and Vibrant only. D'305 iPhone home screen design patent: Yes for SEC's Captivate, Continuum, Droid Charge, Epic 4G, Fascinate, Galaxy S i9000, Galaxy S 4G, Showcase, Gem, Indulge, Infuse 4G, Mesmerize and Vibrant. Yes for STA's Captivate, Continuum, Chrarge, Epic 4G, Fascinate, Galaxy S 4G, Gem, Indulge, Infuse 4G, Mesmerize and Vibrant. Apple proved through evidence that Samsung "took action that it knew or should have known would induce SEA or STA to infringe the D677, D087, D305, and/or D889 Patents." D'677 patent: Yes for Fascinate, Galaxy S 4G, Galaxy S II for AT&T, Galaxy S II for T-Mobile, Epic 4G Touch, Skyrocket, Showcase, Infuse 4G, Mesmerize and Vibrant. D'087 patent: Yes for S 4G, Vibrant. No for Galaxy S II for AT&T, Galaxy S II Epic 4G Touch, S2 Skyrocket and Infuse 4G. D'305: Yes for Captivate, Continuum, Showcase, Gem, Indugle, Infuse 4G, Mesmerize and Vibrant. '889 patent: No for both Galaxy Tab models. Samsung was unable to prove any of Apple's patents were invalid, including the '893 trade dress, while Apple was able to prove only the iPhone 3G trade dress protectable. SEC: Yes to Fascinate, Galaxy S i9000, S 4G, Showcase, Mesmerize, Vibrant. No for Captivate, Continuum, Droid Charge, Epic 4G, Prevail, Galaxy S II for AT&T, S2 i9100, Galaxy S II for T-Mobile, Epic 4G Touch, Skyrocket and Infuse 4G. STA: Yes for Fascinate, Galaxy S 4G, Showcase, Mesmerize and Vibrant. No for Captivate, Continuum, Droid Charge, Epic 4G, Prevail, Galaxy S II for AT&T, Galaxy S II for T-Mobile, Epic 4G Touch, Skyrocket and Infuse 4G. Regarding unregistered iPhone 3G trade dress. SEC: Yes to Fascinate, Galaxy S i9000, Galaxy S 4G, Showcase, Mesmerize and Vibrant. No for Captivate, Continuum, Droid Charge, Epic 4G, Prevail, Galaxy S II for AT&T, Galaxy S II i9100, Galaxy S II for T-Mobile, Epic 4G Touch, Skyrocket and Infuse 4G. 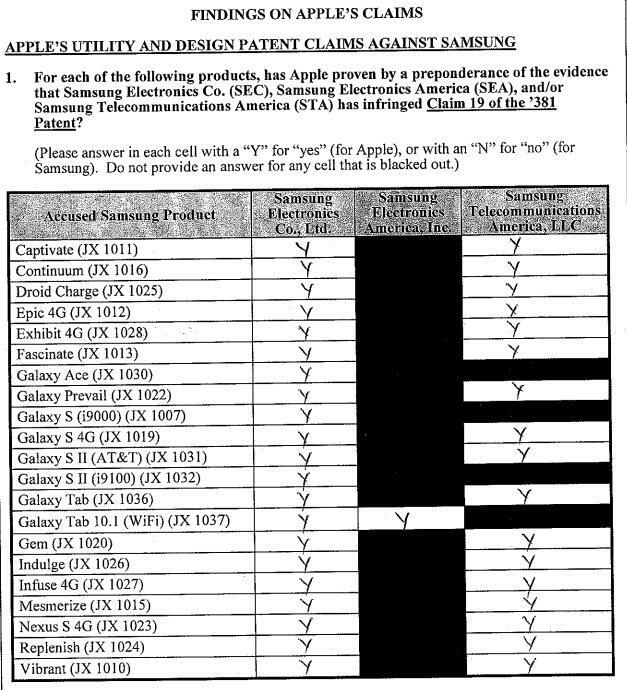 Apple did not prove that Samsung breached obligations with UMTS wireless communications standard nor could the company offer sufficient evidence that the Galaxy maker violated the Sherman Antitrust Act by monopolizing the industry with its technology. Apple was able to prove Samsung is barred from asserting the '516 and '941 patents, those relating to technology used by certain Intel chips in iDevices, as they were exhausted. In order to come to a decision, the jury needed to fill out a complex 20-page verdict form comprised of over 30 multi-part questions, including damages calculations. The quick turnaround, which amounted to a little under 22 hours of deliberations, came without any questions to the court, hinting that the case was a one-sided win. Prior to hearing the verdict, Samsung counsel filed a notice requesting the court hold the jury for 30 minutes in case of inconsistencies relating to damages awarded. Upon review of the verdict form, two inconsistencies were found where the jury awarded damages for the Galaxy Tab 10.1 LTE and Intercept smartphone without citing any infringement. The jury was sent back to fix the error, which dropped the total damages amount to just below $1.05 billion. Apple v. Samsung proceedings began on July 31 after a jury was selected a day earlier, with the Cupertino company seeking up to $2.5 billion in damages on allegations of trade dress infringement. Samsung countered with its own infringement claims, seeking nearly $422 million in royalties. As for Friday's verdict, it was previously reported that the nine-member jury requested to extend their usual workday by one hour, which at the time was thought to be a sign of intense debates. According to TGDaily, after the jurors' normal 9 a.m. to 4:30 p.m. PDT shift was complete, they asked the court to stay an extra hour to finish whatever discussions were taking place behind the jury room's closed doors. The jury sought to find consensus on a combined 40 hours of testimony and a mountain of evidence counsel presented during the court proceedings. Presiding Judge Lucy Koh, on numerous occasions, asked attorneys representing both companies to winnow their claims in hopes of presenting a digestible case to the jury, though counsel still managed to raise a litany of arguments backed by piles of demonstrative exhibits. The proceedings were fraught with drama, from Samsung "leaking" excluded demonstrative exhibits to the media to presiding Judge Lucy Koh losing her temper over the reams of documents submitted by both parties. At issue were seven Apple patents regarding the design of the iPhone and iPad, as well as utility patents relating to the use interface seen in iOS. Apple argued that many of the features seen on 24 Samsung devices blatantly copied the design patents, utility patents, or both, though it was unclear whether the company could prove willful infringement in court, a pre-requisite for awarding damages. A number of internal documents were made public along the way, as Judge Koh mandated an open trial. Seemingly damning evidence included a 132-page Samsung report that included a side-by-side comparison of the iPhone and the Galaxy S.
Apple lodged its first complaint against Samsung in April 2011, saying the South Korean electronics giant copied the look and feel of the iPhone and iPad, sparking a worldwide dispute that now spans over 10 countries across four continents.